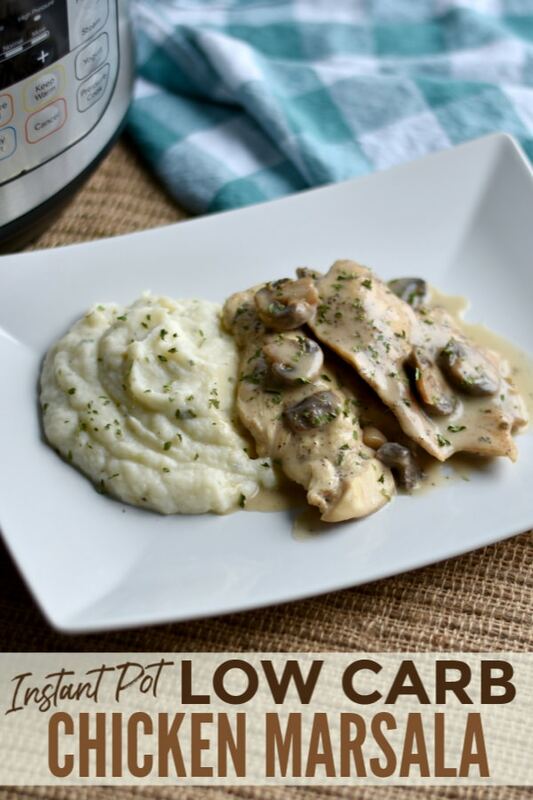 This Instant Pot Low Carb Chicken Marsala is a delicious low carb version of a classic dish. 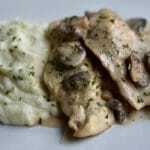 Chicken and mushrooms in a creamy sauce, this is a comforting meal you can enjoy without any guilt. This Instant Pot Low Carb Chicken Marsala is a quick and easy meal that also happens to be loaded with amazing flavor. It’s proof that you don’t have to slave away in the kitchen for hours to create an amazing meal. While the stovetop version isn’t complicated, the Instant Pot frees you from standing over the dish stirring for 15 minutes. Chicken Marsala is an Italian-American dish featuring chicken cutlets, mushrooms, and Marsala wine. Typically, the chicken is dredged in flour, before browning it and adding it to the sauce. Personally, I believe the sauce is the essential component of chicken marsala, so I skip the dredging to cut the carbs and actually enjoy the dish even more this way. Because I leave out the flour dredging and browning step, the sauce does turn out thinner than I like so I do use xanthan gum to thicken the sauce before serving. Aside from being an awesome gluten-free thickener, xanthan gum also has several health benefits (Ketovale) so you not only ditch the carbs, you add a powerful supplement. To make Instant Pot Low Carb Chicken Marsala, you just need to follow a few simple steps. Place a pound and a half of boneless, skinless chicken breasts in a Ziploc bag and seal the bag. Use the flat side of a kitchen mallet to pound the chicken to 1/4 inch thickness. Remove the chicken breasts from the bag and pat them dry with paper towels. Season each breast on both sides with salt and pepper. Press Sauté and wait for the display to read “HOT.” Then, add a tablespoon of oil to the pot. 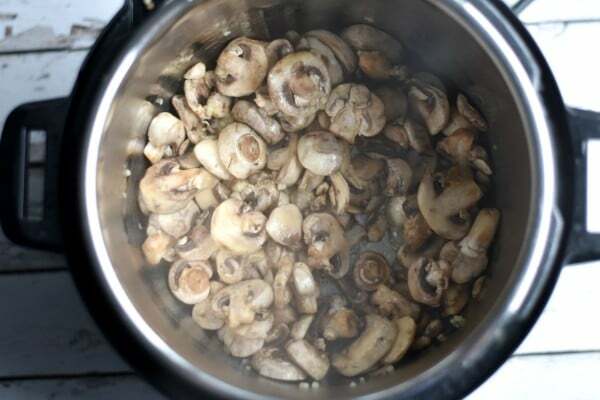 Add 3 cloves of minced garlic and 10 ounces of sliced mushrooms to the oil in the pot. Cook, stirring frequently for 2-3 minutes. 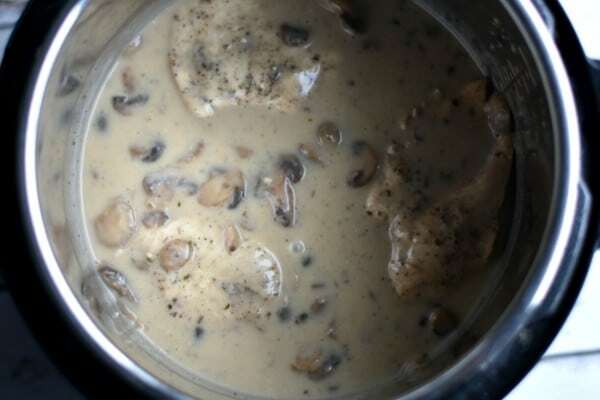 Add 1/2 cup of chicken broth to the mushrooms and use to deglaze the pot by scraping up any bits of the mushroom that have stuck to the bottom. Next, add 1/2 cup of marsala wine, one tablespoon of lemon juice, add half a teaspoon of dried oregano. Stir. Add the chicken breasts on top of the mushrooms and press down until they are submerged by the sauce. Now it’s time for the Instant Pot to take over. Secure the lid and make sure the vent is turned to sealing. Press the Manual/Pressure Cook and set the time to 5 minutes. Because the chicken pieces are thin, this should be sufficient time to cook them all the way through without drying them out. When the cook time ends, quick release the pressure by turning the valve immediately to venting. After the pressure has fully released, press cancel and remove the lid. Remove the chicken breasts to a plate. Press Sauté and add 1/2 cup of heavy whipping cream to the sauce. If you’d like a thick and creamy sauce, scoop some of the sauce into a bowl and add 1/8 teaspoon of xanthan gum to it. Whisk together then stir into the sauce in the Instant Pot. When sauce reaches desired thickness, press Cancel to turn off the pot. Return the chicken to the pot to soak in the sauce and rewarm for just a minute or two. Serve with mashed cauliflower and garnish with parsley. 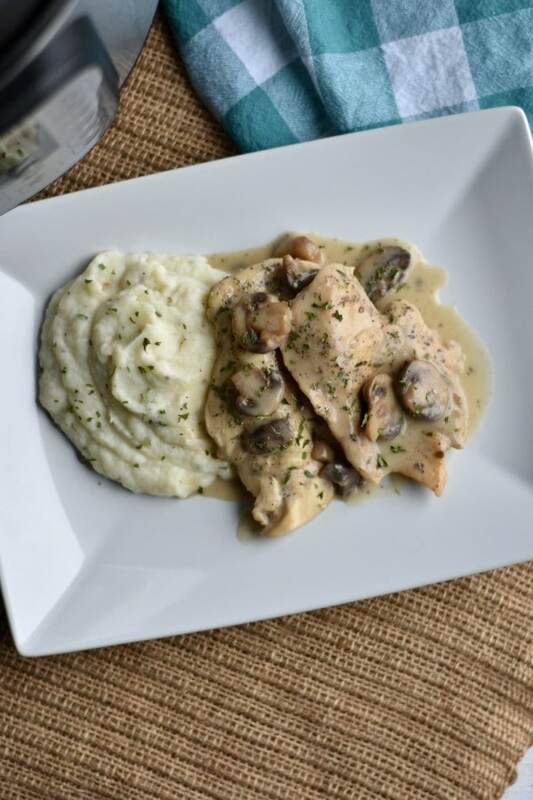 Ready to make your own Instant Pot Low Carb Chicken Marsala? Here are the exact measurements and summarized instructions. Add chicken breasts to Ziploc bag. Pound to 1/4 inch thick using a kitchen mallet. Pat chicken breast dry with paper towels and season on both sides with salt and pepper. Press Sauté on Instant Pot and add oil when the display reads HOT. Add garlic and mushrooms. Cook and stir for 2-3 minutes. Stir in marsala wine, lemon juice, and oregano. Add chicken breasts on top of the mushrooms and press down until they are submerged by the sauce. Secure the Instant Pot lid and turn valve to sealing. Press Manual/Pressure Cook and set time to 5 minutes. When cook time ends, quick release pressure. Press Cancel button. Move chicken breasts to a plate and press Sauté button. Add heavy whipping cream. Stir well. Scoop out some sauce into a small bowl, add xanthan gum and mix well. Pour into the pot and stir until sauce thickens, press cancel to stop sauté mode. Add chicken back in and let marinate in sauce for one or two minutes. 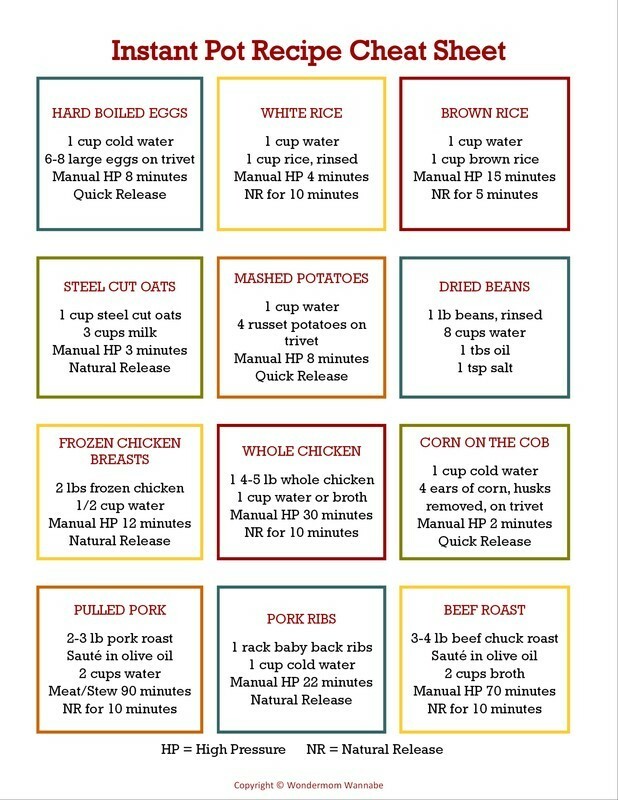 I will sure be trying your Chicken Marsala, it is one of my favorites! Hope you are having a great week and thanks so much for sharing your awesome recipe with us at Full Plate Thursday! I can’t wait to try this! It looks so good!